Spiralling accommodation and travel costs have deterred supporters from travelling to Kiev. Some hotels in Kiev are charging fans up to 100 times their standard rates. 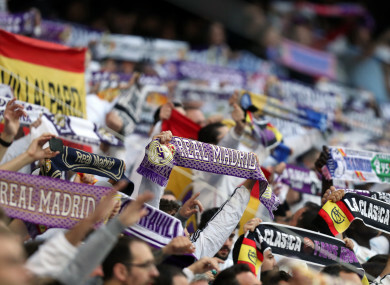 REAL MADRID FANS have returned 1,000 tickets for Saturday’s Champions League final against Liverpool as spiralling accommodation and travel costs deter supporters from travelling to Kiev. Uefa president Aleksander Ceferin said the tickets could not be resold to Liverpool fans for security reasons but they would instead be put on sale for local fans in the Ukrainian capital. As anger mounts over the rocketing prices and cancelled bookings — with some hotels charging up to 100 times their standard rates — Liverpool said they had complained to the “highest levels” of European football’s governing body. Ukrainian UEFA vice-president Grigoriy Surkis criticised the behaviour of hotel owners looking to make a quick buck for the clash between the two European giants, who have won the competition 17 times between them. “I am not disappointed, I am furious,” he told AFP. Around 1,000 Liverpool fans also face the prospect of being stranded in England after a number of charter flights were cancelled due to a disagreement between a travel company and aviation authorities in Kiev over the size of the aircraft. Liverpool chief executive Peter Moore said he was still hopeful a “favourable solution” can be reached to help those left behind. The decision to award the final to Kiev was made before Ceferin’s election as president in 2016 and the Slovenian has already reintroduced a tender process with evaluation reports on cities bidding for finals. He admitted that the black market for tickets was a big problem, with each club originally allocated 16,626 tickets despite worldwide fanbases. According to Uefa, Kiev’s Olimpiyskiy Stadium has a capacity of 63,000 for the game. “We cancelled the tickets that were on the black market but the thing is I am not sure if it is possible to completely prevent it, but we are trying to do as much as possible,” he said. Liverpool head of club and supporter liaison Tony Barrett said he sympathised with fans over their plight. For those of you who get to Kiev, I hope it’s worth every penny and every ounce of effort that you have put in,” he tweeted. But Kiev mayor Vitali Klitschko, the former world heavyweight boxing champion, gave a robust response about the situation in the city. Email “Real Madrid fans return 1,000 Champions League final tickets as price hikes spell misery”. Feedback on “Real Madrid fans return 1,000 Champions League final tickets as price hikes spell misery”.